The PCS500 is a digital storage oscilloscope that uses a computer and its monitor to display waveforms. All standard oscilloscope functions are available through the supplied Windows program. Its operation is identical to that of normal oscilloscope apart from the fact that all operations can be performed with the mouse. 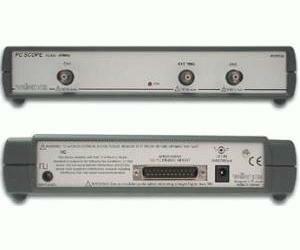 Connection is through the parallel port of the computer, and the scope is completely optically isolated from the computer port. The oscilloscope and transient recorder have two completely separated channels with a sampling frequency up to 1 GHz. Any waveform displayed on the screen can be stored for later use in documents or for the comparison of waveforms.